A great article appeared from Julian et al. 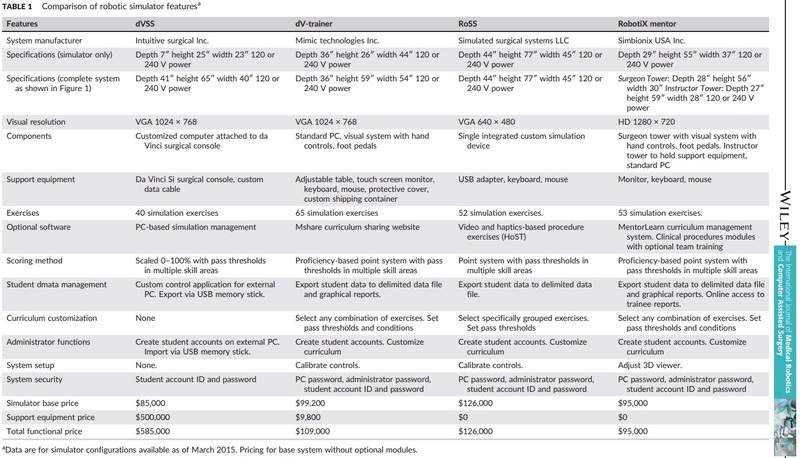 in IJMRCAS: A comparative analysis and guide to virtual reality robotic surgical simulators. AbstractBackground: Since the US Food and Drug Administration approved robotically assisted surgical devices for human surgery in 2000, the number of surgeries utilizing this innovative technology has risen. 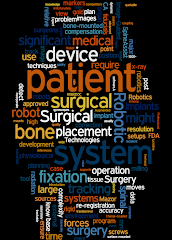 In 2015, approximately 650 000 robot‐assisted procedures were performed worldwide. Surgeons must be properly trained to safely transition to using such innovative technology. Multiple virtual reality robotic simulators are now commercially available for educational and training purposes. There is a need for comparative evaluations of these simulators to aid users in selecting an appropriate device for their purposes.Methods: We conducted a comparison of the design and capabilities of all dedicated simulators of the da Vinci robot – the da Vinci Skills Simulator (dVSS), dV‐Trainer (dVT), Robotic Skills Simulators (RoSS) and the RobotiX Mentor. This paper provides the base specifications of the hardware and software, with an emphasis on the training capabilities of each system. Results: Each simulator contains a large number of training exercises for skills development: dVSS n = 40, dVT n = 65, RoSS n = 52, RobotiX Mentor n = 31. All four offer 3D visual images but use different display technologies. The dVSS leverages the real robotic surgical console to provide visualization, hand controls and foot pedals. The dVT, RoSS and RobotiX Mentor created simulated versions of all of these control systems. Each includes systems management services that allow instructors to collect, export and analyze the scores of students using the simulators.Conclusions: This study provides comparative information on the four simulators' functional capabilities. 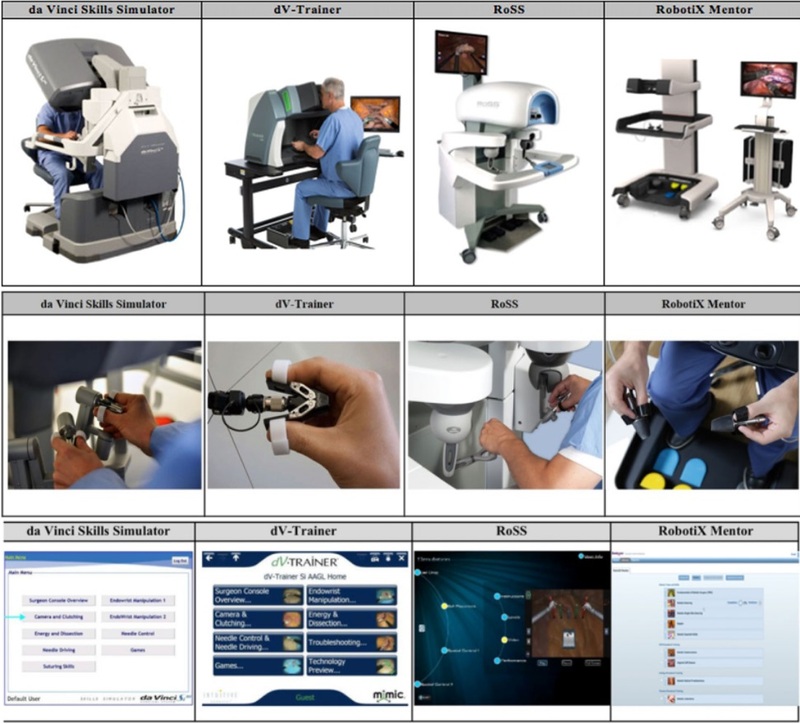 Each device offers unique advantages and capabilities for training robotic surgeons. Each has been the subject of validation experiments, which have been published in the literature. But those do not provide specific details on the capabilities of the simulators, which are necessary for an understanding sufficient to select the one best suited for an organization's needs. This article provides comparative information to assist with that type of selection. The laparoscopic minimally invasive surgical technique is widely employed on a global scale. However, the effcient and ethical teaching of this technique requires equipment for surgical simulation. These educational devices are present on the market in the form of box trainers and virtual reality simulators, or some combination of those. 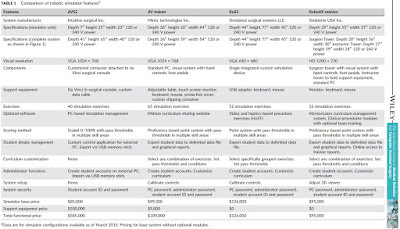 In this article, we present a systematic overview of commercially available surgical simulators describing the most important features of each product. Our overview elaborates on box trainers and virtual reality simulators, and also touches on surgical robotics simulators, together with operating room workﬂow simulators, for the sake of completeness. Apart from presenting educational tools, we evaluated the literature of laparoscopic surgical education and simulation, to provide a complete picture of the unfolding trends in this feld.